Property Location With a stay at Club Quarters Midtown - Times Square, you'll be centrally located in New York, steps from International Center of Photography and minutes from Rockefeller Center. This family-friendly hotel is close to Broadway and Times Square.Rooms Make yourself at home in one of the 170 guestrooms featuring iPads and iPod docking stations. 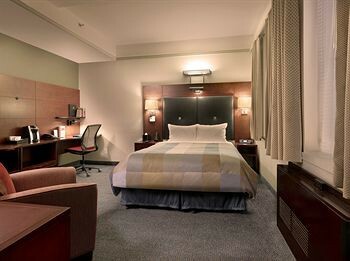 Wired and wireless Internet access is complimentary, and LCD televisions with digital programming provide entertainment. Private bathrooms with showers feature complimentary toiletries and hair dryers. Conveniences include phones, as well as desks and complimentary newspapers.Rec, Spa, Premium Amenities Take advantage of recreation opportunities such as a fitness center, or other amenities including complimentary wireless Internet access and concierge services.Dining Grab a bite to eat at the hotel's restaurant, which features a bar, or stay in and take advantage of room service (during limited hours). Quench your thirst with your favorite drink at a bar/lounge. Cooked-to-order breakfasts are available daily for a fee.Business, Other Amenities Featured amenities include complimentary high-speed (wired) Internet access, a 24-hour business center, and a computer station. Planning an event in New York? This hotel has 1375 square feet (124 square meters) of space consisting of a conference center, conference space, and meeting rooms.